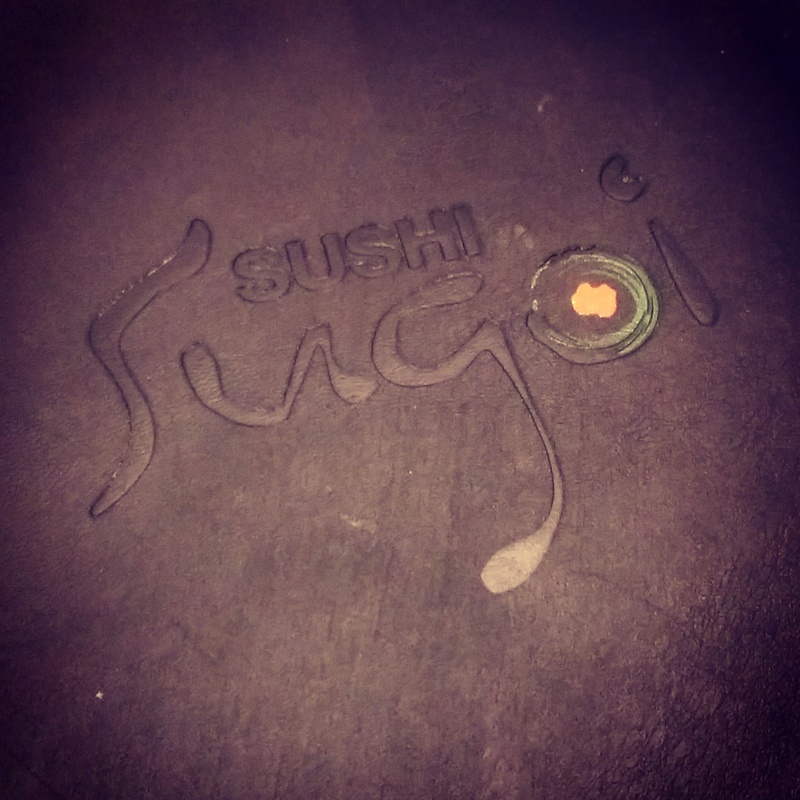 The cover of the Sushi Sugoi menu. Sushi Sugoi (@sugoiedmonton) is one of the newer Japanese restaurants in the city. Open for more than a year now, I had heard good things about it from reviews, friends and neighbours. I usually have good intentions to try a place when it first announces its presence, but, for some reason, I usually never make it until much further down the road. Perhaps I want to avoid any kinks that they might be working out in the kitchen or on the menu. 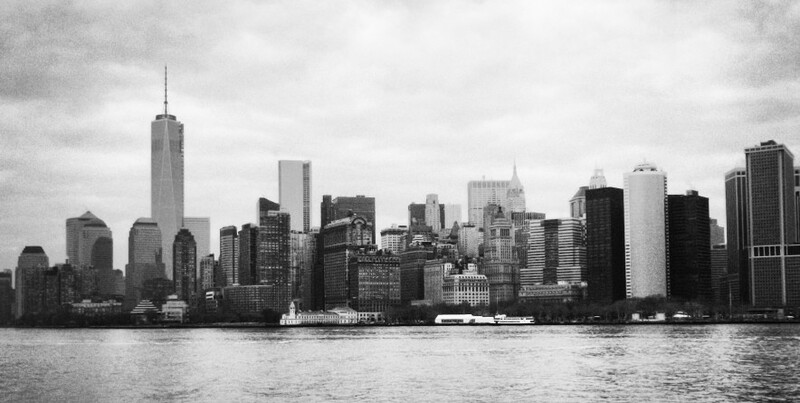 After all, I want a good experience, not one that I’ll regret. My ears initially perked up to the idea of an additional sushi restaurant on the south side of Edmonton when my friend told me she dined there one evening last fall. By the sounds of it, she was wowed by the food and the overall presentation of the dishes, telling me that they looked like works of art. I was certainly intrigued. I followed up her description of their outing by reading some other reviews on Urbanspoon and, lo and behold, they were rated quite favourably (currently they have 76% approval out of 199 votes). I jotted the name down on my vast list of eateries to try and vowed I’d make it there eventually. That brings me to the end of February when I ran into my neighbour on the way to work. Whenever we ride the bus together, food usually ends up being a hot topic of conversation for us. This particular time, I think I was telling her about the amazing sushi that I had eaten in San Diego a few weeks ago, so, of course, we got to talking about sushi in Edmonton. Sure enough, she mentioned Sushi Sugoi, telling me that she quite liked the variety of rolls and that, for the price, the portions served were worth the money. What did I do next? I called my friend who had traveled with me to California, so we could plan our next dinner. By the time we got together, it had been a full month since we had returned from our trip. For us, that is a long overdue meeting. Sushi was definitely in order. Neither of us barely ate during the day, so were starving on our way there after work. The interior of the restaurant has a large sushi bar as its focal point. 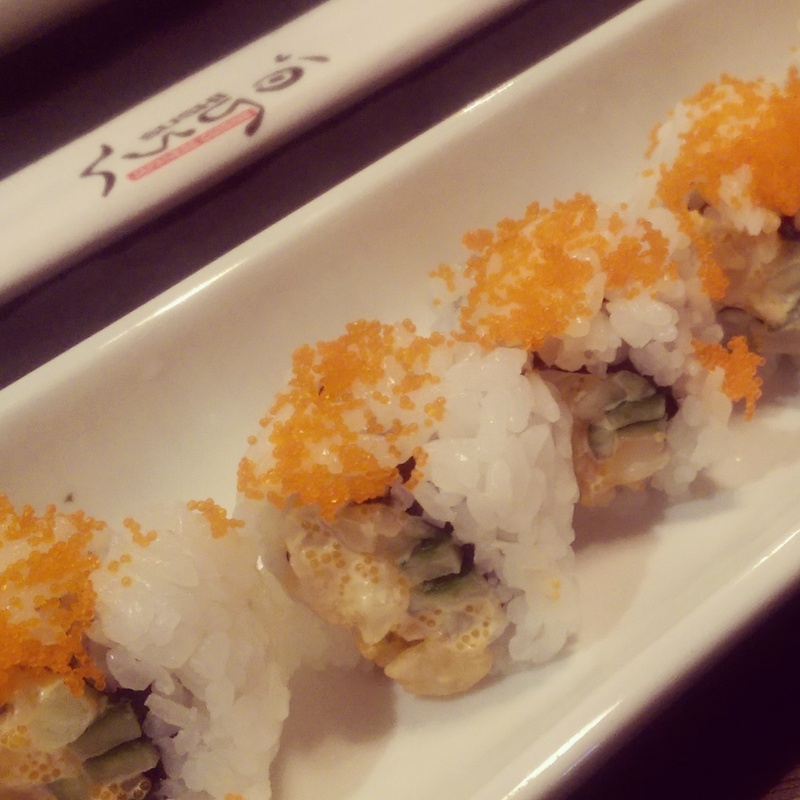 Located along Calgary Trail, Sushi Sugoi sits next to a strip mall. As we drove into the parking lot, it was evident that little thought was put into the exterior of the building because it still looked very much like its predecessor, Outback Steakhouse. Thankfully, upon stepping inside the doors, we saw that the interior of the space had been gutted and redecorated in a very tasteful manner. 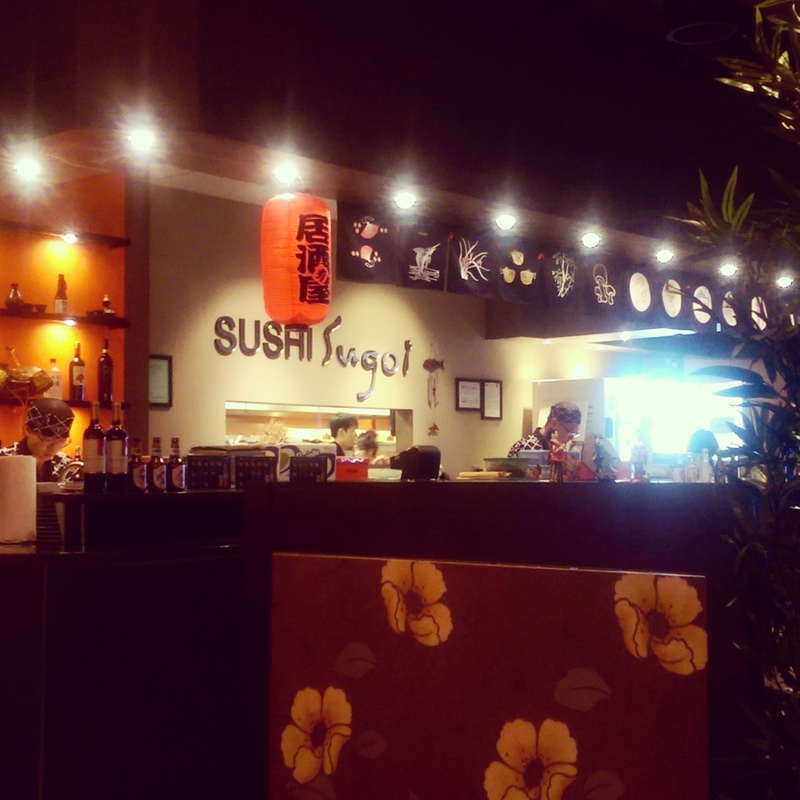 The restaurant is sleek and modern with neutral shades, a few pops of colour and a large sushi bar as its focal point. While we waited at the front counter, I took everything in. Although I could see people standing at the back towards the kitchen, there was no host to greet us when we entered the establishment. A few minutes went by before anyone really acknowledged us, which is something they can improve upon. But, once someone came over, they immediately took us to a booth where we were seated and presented with menus. As we flipped through the many pages of the menu (I cannot emphasize enough how extensive it is), we were also offered o-shibori (hot wet towels), so we could clean our hands before our meal. I thought that was a nice touch. It’s actually something I haven’t seen in a long time. Necessities of the Japanese meal…chopsticks, soy sauce, a sauce dish and tea. The bento boxes are listed on the last page of the menu. The second page of special rolls. The Love Boat special looks amazing, but like a ton of food. What I like about their menu is that it has a clean design, and most items have some sort of description of the dish listed alongside the name, so you’re not going to wonder what exactly you’re about to eat. Similar to other Asian eateries, they still make use of numbering the items and including a selection of corresponding photos for show, but it’s minimal, and the pictures just serve to make your mouth water. Therefore, it took us a while to make our final decisions when it came to ordering our food. Originally, I was quite tempted to go with one of their bento boxes, which are only $15 (even during dinner), or one of their combos. Instead, I changed my mind and opted to test out a few of their rolls. It was hard to pick just three each because they have three menu pages devoted to rolls. I went with a couple of the tried and true – negitoro maki and scallop maki – as a way to compare the quality with what I might find at other places in Edmonton. I also chose the dynamite Alaska from their list of specialty rolls. My friend went with the spicy tataki maki, squash maki and inari maki. My friend’s order of spicy tataki maki. Another of my friend’s choices: squash maki. Since I didn’t sample any of my friends rolls on this particular occasion, I cannot comment myself on how good hers were, but they did look yummy. She also told me she enjoyed them, and she would definitely come back to eat at Sushi Sugoi again. I guess my one qualm with the service is that not all of the rolls ordered came out together, which is bound to happen at times. However, my dynamite Alaska showed up quite a bit later than the other two. Often, when I eat, I like to alternate between the different items, allowing you to really take in all the flavours and combinations. It’s like a workout for your taste buds. When you’re eating just one type of roll all at once, sometimes it becomes overwhelming or everything just starts tasting the same. So, I would have liked for the last roll to arrive at the table earlier. No matter though, it is what it is. I was started off with the scallop maki. 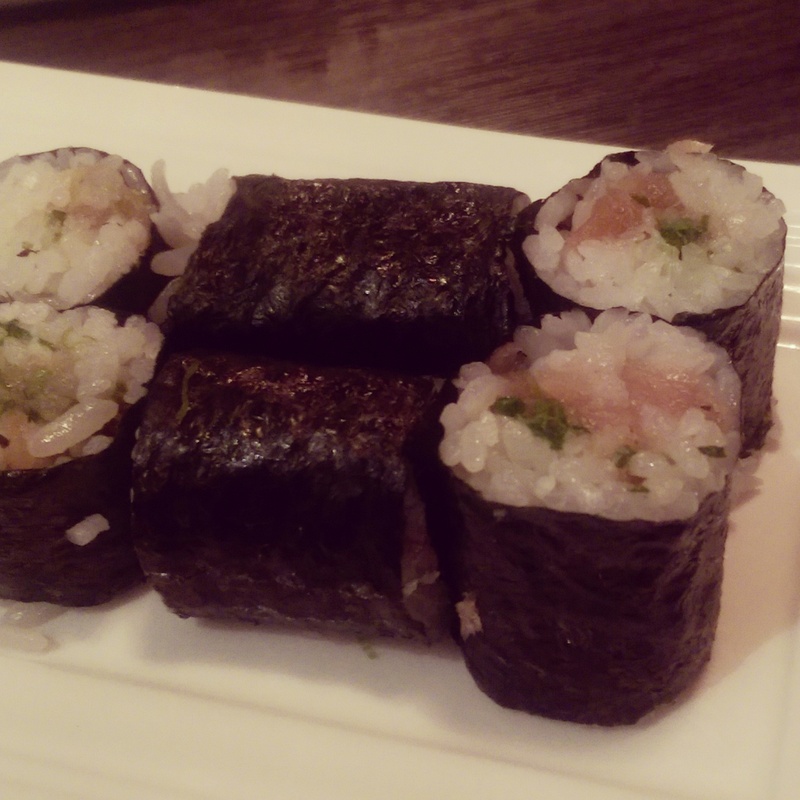 In my mind, I saw it as the traditional maki, wrapped in black seaweed with just a small center of scallop. Turns out, it was uramaki (an inside-out roll) with the rice wrapped around the seaweed and a fairly large middle of chopped scallop. The taste and texture of the rice was just right (slightly sticky and vinegary). The tender raw scallops were paired with tobiko and then coated with a decent amount of Japanese mayo – mixed in to give it a little bit of creaminess and tang – to create a bite that had a melt-in-your-mouth consistency. The negitoro maki is how I imagined my scallop maki would be. Bite sized rolls filled with fatty tuna and chopped green onion (I believe the onions might be grown in their Urban Cultivator, which they use to grow their own organic greens and herbs year round), these were delicious. The green onions were extremely flavourful and fresh, as was the fish. The dynamite Alaska roll was massive. Each piece was about the size of my fist, so it’s not conducive to keeping your food from falling apart. As anyone who eats sushi knows, the bigger the roll, the more difficult it is to eat in a polite manner. Etiquette suggests that you eat with either your chopsticks or your hands (as long as they’re clean), and typically, you should eat a piece of sushi in one fell swoop. The problem in North America lies with the idea of “bigger is better” where the rolls have become so large that it’s near impossible to do so. Sometimes you can still stuff the whole roll in your mouth, but you likely look like a chipmunk storing food away for the cold winter months. Inevitably, with these huge rolls you must give in and bite it apart. That’s when it usually becomes a messy pile on your plate (probably because you couldn’t quite cut that seaweed apart with your teeth). Luckily, that wasn’t really the case this time. I credit it to the fact that the roll was fried on the outside, giving the seaweed a crunchy texture that was much easier to break apart. The ease with which this dish was consumed despite the size of its portions, is one of the main positives of this roll. While it tasted pretty good, it was quite heavy as the fried batter on the outside was thick (thankfully not greasy), so it was maybe too much in that respect. According to the menu, the middle was stuffed with smoked salmon, tobiko, prawn tempura, yam tempura, crab meat and vegetables. Smoked salmon, being a strong flavour was the most distinguishable ingredient by taste. 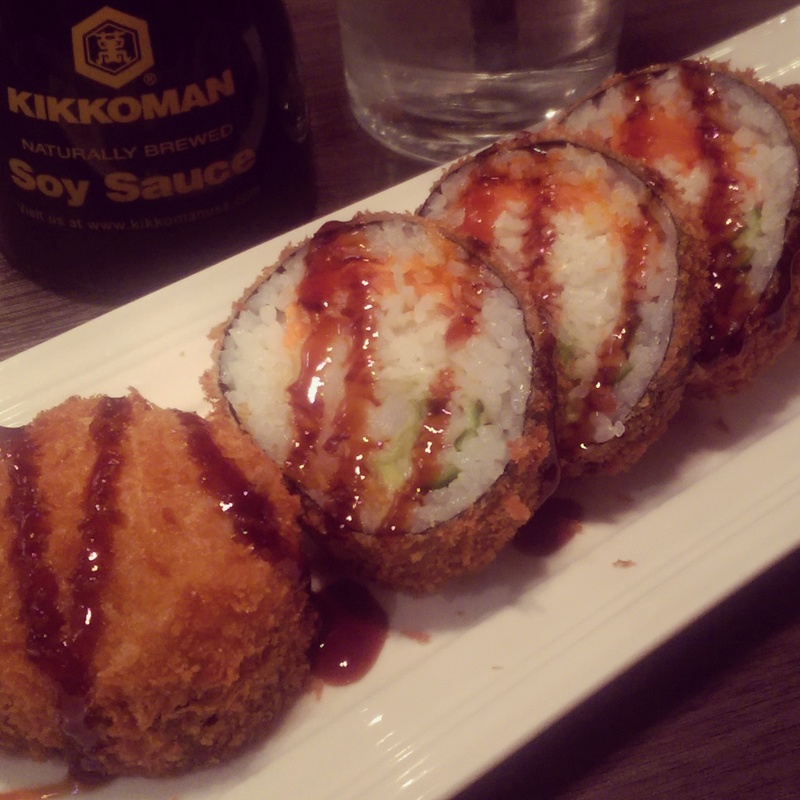 I couldn’t really tell there was any yam tempura in the roll and the crab meat is of the imitation variety. This roll was simply okay. The main problem with rolls this large is that when it has to be divided into fractions, you’re probably only getting a bite with crab meat and nothing else. The point of combining all of those things in the middle is that they should really be eaten as a whole, and you can’t do that here. I most likely won’t order this one again, unless someone shares a plate with me. It really is best in smaller doses. Overall, I’m leaning towards saying that I like Sushi Sugoi. The service, once they noticed us, was decent. Since the food was brought out in stages, our server was at our table enough to ensure that she checked on our satisfaction thoroughly. Regarding the food, I really liked the more traditional rolls that I had. Those were delicious; they used what seemed like very fresh ingredients while keeping the consistency of the rice perfect, which is so important when it comes to sushi. My only wish is that they stop relying so much on the imitation crab meat in their rolls (20 out of 58 make use of it) because that brings the quality down a notch, and that’s a shame. I really want the food to match the beauty of the space, and it does in some aspects, but not all. Hopefully, they’ll work on that since so many of those rolls sound absolutely scrumptious. I certainly don’t regret this visit though. In fact, I’ll probably be back soon, but I’ll be sure to stick to the tried and true classics from now on.